First lets get the record straight; I don't nap. Never a napper. Tried it a few times. Didn't like it. You don't get much done napping. I'd rather have a coffee. Which is what i should have done today at 1:30 pm instead of shaking off my boots and diving head first into bed. Have you ever had a lucid dream? I've had them a few times; always when napping in the middle of the day. It's a dream you can completely control.. When you're lucky enough to have a dream like this it's generally advisable to find Clive Owen right away or take flight at the helm of a F14 tomcat. You don't want to be reincarnated as John Goodman and be sitting in a board room at Warner Bros. having an argument with your agent as I was today. Yikes. Lucid dreams are so weird. This arrangement is so lovely--reminds me of a wild meadow. Since I know you're not very busy these days, WHERE'S YOUR BOOK? I promise to buy it. Posts like this are only one of the many reasons that I love this blog. Keep on keeping on, girl. Loooove this arrangement so much. It's all be-tendriled and floaty. This is what I hope to find in my lucid dreams! but were you john goodman IN CHARACTER, as, say walter from "the big lebowski"? because that there would be some lucid dreaming worth falling into! 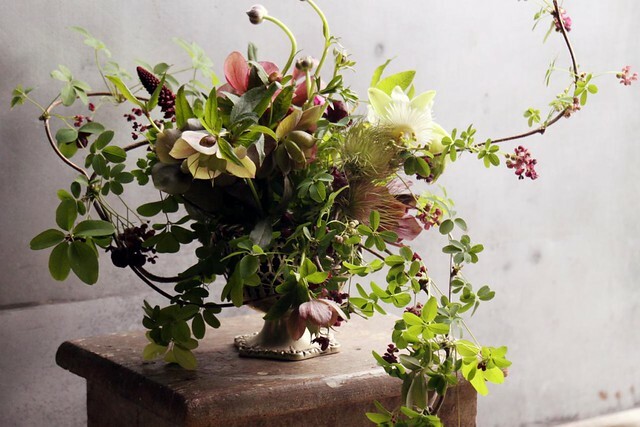 i love the name hellebore...saw you in the T Magazine and felt like I was seeing a friend in print! Love it! Though you might think napping is a waste - that arrangement certainly isn't! I just love your flowers! This arrangeent makes me weep with joy! It is the most beautiful thing I have seen in a long time. Thank you so much! It is just beautiful...what more can I say!